Hundreds of thousands of Christian pilgrims and tourists from around the world are expected in Bethlehem for Christmas Midnight Mass. About 120,000 visitors are in the Palestinian West Bank town, 30% up on last year, officials said. Crowds gathered early to sing carols around the 50ft (15m) Christmas tree in Manger Square. Celebrations will culminate in Midnight Mass at the 1,700-year-old Church of the Nativity, built on the spot where it is believed Jesus was born. The Latin Patriarch of Jerusalem, Fuad Twal, has travelled from Jerusalem to Bethlehem, where he will later lead the Midnight Mass. He passed through the massive gate in the controversial Israeli security barrier that separates Jerusalem from Bethlehem and arrived in Manger Square, where he was greeted with a bagpipe band. Patriarch Fuad Twal, a Palestinian who is a Jordanian citizen, has expressed concern for Christians in the current upheavals in the Middle East and asked them to support the moves towards freedom and democracy. 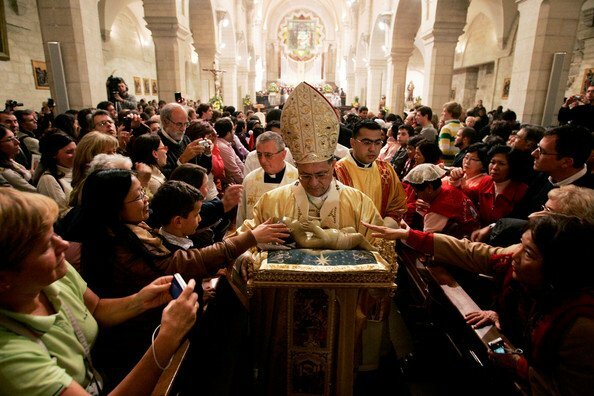 His midnight homily will urge “the return of calm and reconciliation in Syria, in Egypt, in Iraq and in North Africa”. Boy scouts with drums and bagpipes have taken part in the traditional afternoon procession through the town. Restaurants and shops selling memorabilia such as olive wood-carved religious statues were doing brisk trade as habit-wearing monks rubbed shoulders with Father Christmas hat-wearing Filipino tourists. Bethlehem Mayor Victor Batarseh said he hoped the festivities would bring Palestinians closer to their dream of statehood. Israel controls access to Bethlehem through checkpoints and the controversial barrier. Residents say their livelihoods are imperiled by the barrier, which skirts around the edge of Bethlehem, surrounding it on three sides. Once predominantly Christian, two-thirds of Bethlehem’s 50,000 residents are now Muslim. Some say the economic restrictions imposed by Israel are the main reason behind the exodus of Christians from the West Bank; others cite persecution by militant Muslims.